It is clear that we should not review people only on the basis of their physical attributes or deficiencies, and each of us should develop an open mind. However, it is true that our brain often evaluates and evaluates, even when we are not aware of it. On the way to the summit, it is worth emphasizing your competences, also with a thoughtful look, because - no matter how we try - we do not live only in the world of ideas, and our head has some built-in tracing paper. How you are perceived directly affects the possibility of promotion or the amount of your salary. The facts say that the better you look, the better you earn. So we share three relationships that are worth paying attention to because they are fundamental to the career and content of your portfolio. It is true that tall people earn more money ... and we do not mean mainly athletes! Numerous studies confirm that growth is an extremely important factor that affects the image of politics. In the American presidential election of 1900-1968, each time he won the candidate who was higher. In the last elections, this trend has also repeated itself. Similarly, the issue of the presidents of the largest listed companies in the world: 58 percent. of them is over 182 cm tall - it is four times more than the population average. Fortunately, we live in times when we can deceive the fate a bit, because we have an influence also on our growth. With the help of a suitably selected wardrobe (monochromatic combinations, rather dark tones, striped suits) and hairstyles (slender and selected to the shape of the face) we are able to optically extend. The most important, however, is what will actually add us a few centimeters, as well as a straight figure and self-confidence: increasing footwear. For example, the Betelli brand took care to keep the proportions of the traditional shoe, thanks to which they retain a completely natural look: they do not have a high heel or a high heel, and they guarantee adequate ventilation and provide a free step. Specially developed boost insert not only adds height, but also absorbs and absorbs pressure while walking, providing feet with full comfort. Gentlemen can rely on the classics by choosing simple, black footwear with Oxford caps, and for other bolder gentlemen there are other, elegant patterns available. Betelli shoes perfect for business meetings. Experts, referring to recent research in Poland, emphasize that the obesity of I, II and III degree suffers a total of 27 percent. society. They add that if you combine this data with diagnosed overweight - this number reaches nearly 70%. Poles. Everyone agrees that "obesity is a silent killer". Statistically, so you are in a group of people, which certainly will not hurt consultation with a dietitian. Do not take a negligent matter, because you will not get far in a spoiling trolley, and treating obesity complications is much more expensive than treating the disease itself. Are you still not convinced? The research is clear: "bones" people are generally seen as more lazy, slow and less willing to work. What's interesting at the same time we consider them to be more polite, kind and with a greater sense of humor ... but your wallet will not grow! Do you eat well and think that a little belly is more of a body to love? Maybe so but it's definitely worth taking up for the sport. According to a study published in the Journal of Labor Research, employees who practice regularly earn an average of 9 percent more than those who do not. Cleveland State University has shown that people who exercise three or more times a week earn an average of $ 80 a week more than their lazy associates. Why? They gain self-confidence and with every hour of sport they build predispositions for leadership in the group. It's an investment that pays off! And although the increase of the speech in the above point, here it is also ideal for increasing shoes, thanks to which the figure slims down. Do you know the phrase "pull in your stomach"? It happens the same if you are taller or have extra support in your wardrobe. Ladies know well how it works, that's why they look so neat in high heels - such shoes not only optically slim but affect the entire posture: they force calm, balanced and light gait, and the back is naturally straight. Betelli elevator shoes always add confidence. It is worth remembering that there is one more rule in the business world: if people think that you are representative, they will pay you more money. This is confirmed by the study of Daniel Hamermesh from Yale University. Interestingly, this rule applies equally to men and women. Handsome men earn around 5 percent more on average, while unattractive employees may lose as much as 9 percent of their salary as a result of their appearance. In the case of men for an attractive appearance they consist of regular features and a clearly defined jaw but also so-called neatness or impeccable clothes, carefully groomed facial hair or a smooth face. Enlargement of the wardrobe with a few new shirts, regular use of well-chosen cosmetics, the purchase of a good machine, or a visit to a hairdresser and dermatologist are not hedonistic but a wise allocation of resources to increase property resources in the future. 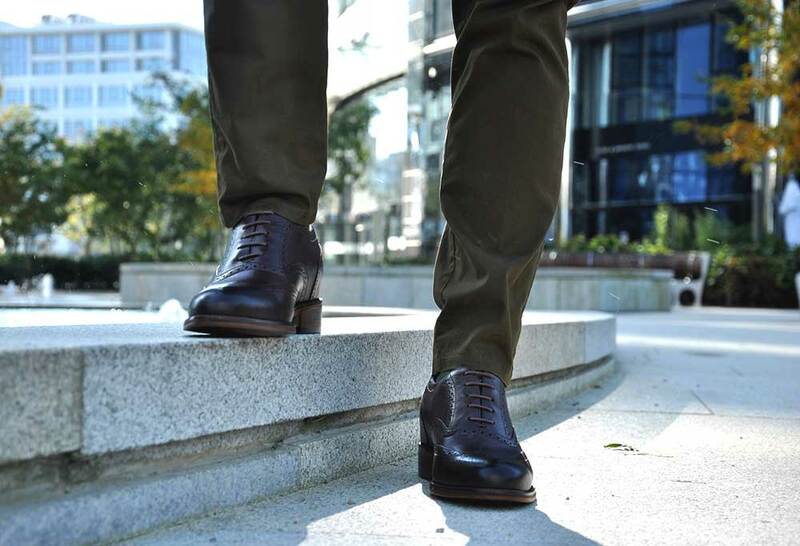 Each stylization of a well-groomed man is completed by appropriately selected accessories - watch and leather shoes are considered the most important. In good taste, also flies, braces and hats - these should be chosen with great care. The timer does not have to come from a renowned Swiss manufactory, the most important rule is that the more formal outfit, the less ornaments should have a watch. The formal shoes should be tailored to the occasion - they can be black and subdued, providing a classic look or a stylish and modern one, decorated with a perforated pattern. The latter with the right styling can be, also perfect every day. How to do it? Just complete the casual look - these are now very fashionable - colorful socks. Such an addition can bring a lot, and also be the proverbial dot over and. When it comes to footwear, the choice is really wide and you should not be afraid. Do you feel that patterned socks are too much, and would you like a soft touch? The Betelli brand offers a classic black leather shoe, which is placed on a brown leather sole (model Veneto) - this insert can add a more modest but noticeable fit. Today when you buy footwear you can really go wild and still look classy. Betelli shoes are additionally raised by 7 cm. Do not forget that color is probably the strongest element in the overall pronunciation of our outfit, because we all subconsciously use colors to express moods and personalities. Before we go to a mall, it would be good to know their psychological significance in order to display our qualities that are desirable in a professional environment. Pomegranate, which is a combination of blue and black, is the favorite color of business. Why? Blue symbolizes peace, dignity, seriousness while black adds power. Pomegranate works for all garments and every business situation, which is why a navy blue suit (or a suit) is a must-have item in the wardrobe of a successful man. White means purity, elegance and peace, inspires trust, which is why it is perfect for shirts and blouses. The shirt and ties look good, also a darker shade of purple, which is associated with the highest quality, wealth and luxury. What else can you score? If inspiring trust is an important element of the work, zakoleguj with bronze and fuchsia. The first color gives encouragement and positive support, the second raises confidence and means faith in the success of the actions taken. If you know that you are waiting for heavy negotiations, turn to blue - it soothes, serves good communication, radiates with authority and elegance. Intense shades brighten up thinking, brighter colors soothe and strengthen concentration. In business, blue is suitable for all garments. We do not have to be afraid, also on footwear - the Betelli Capri model is a combination of shades of blue and brown. Boosting shoes 7 cm made entirely of natural leather. They are a perfect solution for those who appreciate classics and original character.